Maryland Pink and Green: Cookie Monster...Really? Ok. It’s official. I have to tell you that I like to think that I have the pulse of fashion at the tip of my fingers and in my wardrobe, but there’s a huge trend that has me baffled. Working with teenagers all day, apart from being one of the most fun and rewarding jobs, allows me to see a lot of the trends and fashion statements that teens make. 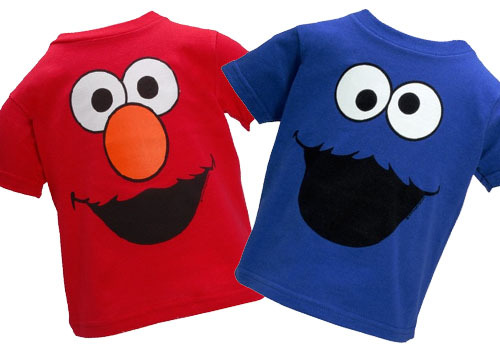 Lately, I’ve been seeing Elmo and Cookie Monster t-shirts on everyone around town. At first, I thought it was an anomaly. In fact I wondered about a student who wore the cookie monster shirt so frequently think he has to wash it every night. Then I saw a cheerleader wearing a cookie monster shirt. And kids in student government. And kids in band. Pretty much everyone has a Cookie Monster or Elmo shirt. I, your humble fashion servant, had no idea that Cookie Monster was cool. Have you seen this trend where you live? I will have to start paying attention...I tend to avert my eyes from the fashions we see in my town lest my psyche is permanantly damaged by pajamas in Wallies or wife beaters at the playground. This is hilarious! I haven't seen the teen trend, but I certainly believe it. This brings me back to some of my own teen fashion blunders like stealing my dad's socks! O my!! P.S. I think I need more instructions on the Friday Follow. I joined but it didn't show up on my blog? Thanks!! I saw this to a small extent a few years ago...But all those people were wearing super faded ones and the thing was to wear shirts that you hypothetically wore when you were 5. I haven't seen anyone wearing Cookie Monster lately, save for that guy who wears it with his (not kidding at all) heart boxers in my chemistry lecture. This makes me very happy. I love ELMO and have since I first saw him many (I don't say how many is really many) years ago. Gotta get my Elmo shirt out. I love that one of your Minnies said Ganster!!! Ha! What? That is too funny! A blue puppet is "gangster?" Hilarious! One of my eleven-yr-old's fiends has a Cookie Monster hat. I think it looks ridiculous! I told S "Never!" I have seen this!! It is bad! I need to start paying more attention to what everyone is wearing around me. Who knows what I might discover. This makes me laugh...bunches. What? I haven't paid any attention to either of them since I was in elementary school. It's amazing what comes back in style. Lord help us all if we find ourselves out shopping for a Coca-Cola T-shirt in the near future! LOL, love the idea of Cookie Monster being "gangster." Thanks for the grins.